For those that are unaware, the Street Prepared Advisory Committee (SPAC) has moved the RX-8 from B Street Prepared (BSP), to D Street Prepared (DSP). For a lot of people, especially RX-8 owners, they are pretty excited to see this change go through. Then again, there are a few that disagree with the decision to move the RX-8 to DSP. I've been relatively quiet about the move except for with a select few, but I figure now is the time to lay my thoughts out. For starters, I'm fairly neutral for the most part on the decision, but slightly leaning towards not liking the move. Now, you're probably saying "But you have more of a chance, it makes sense, and it's technically an easier win!" as I've heard most others say. Personally, I'm a data person. On paper, a ideal, fully prepped Street Prepared RX-8 apparently doesn't compare to the likes of a prepped Honda S2000 or Nissan 350Z. But if everything was always based off of "on paper" stats, a lot of things would be different now wouldn't they? 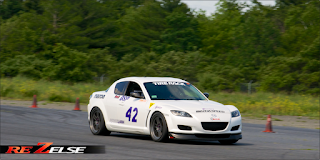 My thoughts are that we have never seen a fully prepped Street Prepared RX-8 at the National level, let alone a battle between a fully prepped RX-8 / S2000 / 350Z in SP. 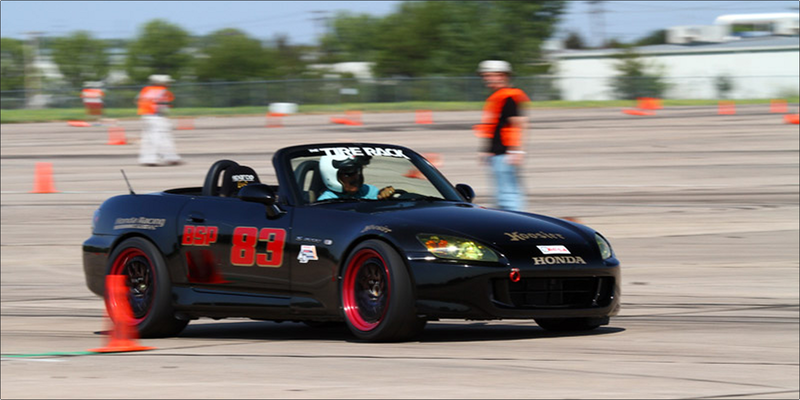 The S2000 has the weight advantage, similar handling to the RX-8, and can only fit 285's from what I've heard. 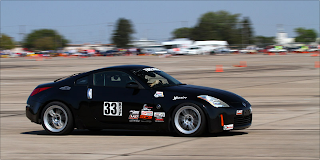 The 350Z has the power and torque, and can fit 315s (or is it 305s?) all around, but has the heaviest weight of the two. So if we've never seen such a battle, and no one has made a fully prepped RX-8, why move it? Seems to me the RX-8 is almost an "inbetween guy" of the S2000 and the 350Z. People speculate, bench race, come up with all sorts of ideas I've noticed... Especially those that haven't even driven an RX-8! I was told by someone who has co-driven an RX-8 in C Stock that I should be able to fit 315's no problem... Yet, I can barely fit 285 sized Hoosiers. Not because of the fender, but because the end of the frame is RIGHT behind the wheel well plastic (so no, fender flares wouldn't help). Could I get wheels that have more of a inward offset? Sure, but then you run into the risk of rubbing against the springs, or even the swaybar. What about a size 17 wheel? Well, a lot of people subscribe to that theory I've noticed too. The wheels ARE lighter, but it's one of those "gut feelings" that I have that the RX-8 was made to work with a 18" wheel. Could I be wrong? Sure, but I just feel like I would essentially have to reconfigure the whole alignment and height for wheels that would only give me a minimal increased benefit, IF any. But again, these are my personal thoughts and I'm open to hear anyone else's thoughts. I was also told that the RX-8 would never be able to make the power that "I desire". Never ever. Unless I go forced induction, 3 rotor, or both. Really? Like...TRULY? Firstly, what is "power I desire"? Personally, I like under-powered cars. You get to stay on the throttle longer and have to learn how to use momentum to keep up your speed. So the rated 232 HP to the flywheel is a pretty good starting point for a momentum car. A little fun fact, a freshly built series 2 RX-8 engine with everything stock came in with just shy of 280 HP to the flywheel. Fascinating, no? Back on track here... So stock is rated for 232 HP at the flywheel, and if it's a good, healthy engine, people have seen about 180 HP at the rear wheels typically on a DynoJet dyno. Now remember, some people live by dyno numbers, and some people scowl at them. My experience? It's a measuring tool. Find the dyno that measures HP and TQ the way that makes the most sense to you, and then go for it. From there, as long as you understand how it's measuring, you can then build your conclusions when reading your dyno chart. For me? After all my modifications and work, and with an engine that is in the mid 9's for compression, I came in with only 177 HP and 127 TQ. Now if we turned the dyno to measure in a way that is similar to DynoJet, suddenly my car has 218 HP and 160 TQ. So what's the real number? All depends what you want to believe I suppose. Either way, if my car is outputting 218 HP to the wheels in DynoJet mode, and a stock one is outputting around 180 HP to the wheels... I'd like to think I did a pretty damn good job, especially when I don't even have my header back, nor a final tune with the header on. Food for thought. Anyone ever watch Hot Version or Best Motoring videos? Ever notice they always pit the RX-8 against Subaru WRXs, Nissan 350Zs, Nissan G35 Coupes, and Honda S2000s? Now of course, touge racing or track racing is very different than autocross, but you can't help but notice those facts. In the end, it's like I said; I want to see results and data. Personally, I think that is the mentality we should all have before just up and making changes to things (unless it really doesn't make sense). Whether it moved to DSP, ESP, or anything else, I still would drive my car no matter what. Given that I will be in S2 at the ProSolo in New Jersey, which S2 consists of BSP and DSP, I'll be looking forward to seeing the results. Even though a ProSolo puts the odds against me because of the launch start, I'd still like to see how everything turns out in the end. Thoughts anyone? Overall I think the move is a good thing. The BMWs in DSP are the class of the class and the RX8 should do well against them. I am running 295/30-18s on my stock wheels now, what about 295s on the wider rims? The 295's are not that much wider so they should not give a rub issue. I still have yet to try out the 295's on the 18x10. My concern would be rubbing against the plastic inside fender because it just barely clears enough as it is.